What Makes a Great Hotel Room, and How Can They Ruin It? God Save the Points asks what makes a great hotel room. His list includes well-located power ports; plenty of bottled water; fast wifi; motion-sensing night lights; luggage space; amenity kit; and working quiet air conditioning. I’ve given a lot of thought to what makes a hotel great, and how simple design flaws can ruin a property. More often though great physical properties can be ruined by poor service execution or short-sighted cost cuts. Hoteliers: ever wonder why a property with great facilities and a competitive room rate in a good location isn’t getting the level of midweek repeat business it might expect? It may come down to something simple. Hotels taking part of the room rate out and burying it in fine print is fraud. We get up in arms over airfare displays when already those are pretty clear and clean, it’s hotels where the worst behavior happens. These are not optional charges, so they are part of the room rate. Not including them in the room rate is disingenuous. In 2012 the Federal Trade Commission warned hotel chains that mandatory resort fees may be illegal. Venetian and Palazzo in Las Vegas were sued over their resort fees. Some Florida properties no longer charge resort fees as a result of a settlement with that state’s attorney general. Yet mandatory add-on fees have been spreading to city locations. The idea of the free $50 a night long distance call and access to the hotel gym is no longer limited to resort hotels. When a hotel decides to charge you for something that wasn’t on your folio when you checked out, by just billing your credit card, they should have to email to let you know they are doing it and identify the item(s). By all means, you should pay what you owe, but a huge pet peeve is additional (usually small) charges showing up on my credit card statement days later. If I didn’t comb through my statements I wouldn’t even know they had done this. And then I have to get in touch with the property to find out what this additional charge is even for. If a hotel’s systems and processes are too poor to identify charges before checkout, they should at the very least proactively reach out to the customer to explain they’re hitting the card for more charges and send a statement detailing those charges. Don’t leave it to the customer to notice they’ve been hit, and then have to do research to understand why. A Hyatt property once billed me for the cash portion of a cash and points award five months after my stay. At another Hyatt they always they tell me in-room bottled water is complementary for top tier elite members and then they bill my credit card for it after I’ve checked out. They’re happy to remove the charge when called on it. But since it doesn’t make the final folio, it requires followup — which is more costly in my time and theirs than the actual charge itself. How am I supposed to submit an expense report for a charge I don’t know about? Why make me spend more time tracking down these charges than the charges are worth? And why put me in the awkward position of submitting expenses for an old, closed-out trip? Hotels should have 24 hour coffee available and access to real milk and cream. 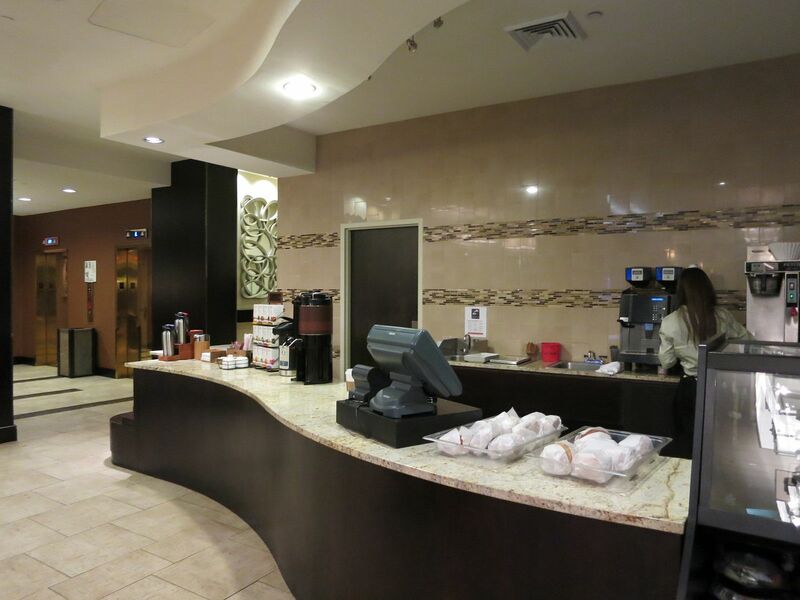 A business hotel needs to be able to provide coffee 24 hours a day. There are lots of ways to do this: in-room machines, club lounge, lobby, and even room service. The coffee needs to be drinkable, and that includes making it possible to get the real milk or creamer of your choice. That’s just basics. Hotels without in-room coffee, and a lobby option, and that do not offer 24 hour room service are a complete and total fail. Claiming to be an upscale or full service property, and aiming at business travelers, they’re completely missing the point. You’re coming in from another time zone, and getting up at 4. You have an early flight. You need to get up early to work on a presentation. Morning coffee can set the tone for the whole day, and entire stay. 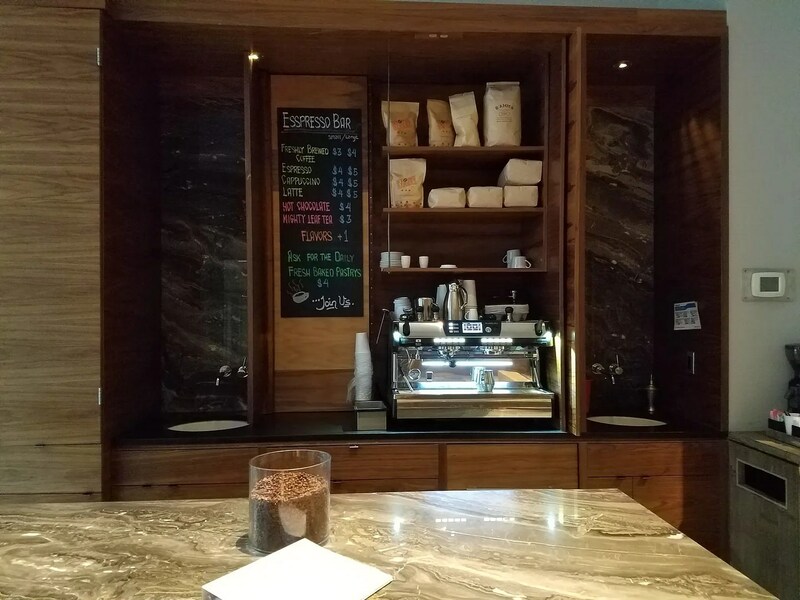 The coffee bar at the Hilton New York JFK.. more than once I’ve shown up half an hour after opening to find no one working, this time I got lucky! I once stayed at what was then the W San Diego and rang up the “Whatever Whenever” line at 5 a.m. They were supposed to be able to get Whatever you want Whenever you want it. I wanted coffee at 5 a.m.. They told me no, coffee isn’t available until 6. If there’s a coffee shop or coffee stand in the lobby, it needs to be open at its posted time. If the coffee shop opens at 6 then gosh darnit it should be staffed at 6… not 6:15 or 6:30. Walls should be thick enough not to hear your neighbor, or the elevator. And connecting rooms are for families traveling together. Please don’t assign one to me. Natural light is great, but not when a guest is trying to sleep. A room should be able to get light, but also keep out the light. And do not disturb means… do not disturb. If I’ve got do not disturb on, housekeeping shouldn’t knock on the door. Don’t call me an hour after arrival, either, to see how I like the room? If there was a problem, I’d have let you know. And if I’m off an overnight flight, I may be trying to take a quick nap so I can power through to dinner and adjust to the local time quickly. A hotel should help get you on your way. If they can’t get your car out of mandatory valet parking within 15 minutes they shouldn’t charge. Or better yet: a hotel can usually project its occupancy levels, and is aware of the conferences and events it is hosting. Staff appropriately relative to occupancy. When I get into a hotel room, usually the first thing I do is wash my hands. I’ve been traveling. That means unwrapping the soap. It goes into the soap dish beside the sink. So in the morning I get into the shower and find there’s no soap and I have to get out of the shower and put the soap from the soap dish beside the sink into the shower? That’s an early morning fail. If a hotel has to tell me my room is an upgrade, if it’s not something I’m going to notice myself, then it isn’t an upgrade. And if they have to outsource it to a written note, because the front desk agent either won’t notice the room I have is better than standard or is going to be too bashful to tell me my room over the HVAC is an upgrade, then it isn’t one. A simple corollary is that an executive floor room is not an upgrade. Executive floor benefits are. But especially if you’re entitled to those anyway, the room itself is rarely any different than one on another floor. Telling guests that it’s an upgrade doesn’t make it one. If you aren’t going to upgrade me, I understand. Play by the rules, hotels sell out, or have too many elites and I accept that. But don’t lie to me and tell me my room that’s just like the others is special just for me because of my status. An airport hotel needs to be able to reliably get you to and from the airport. The whole point of staying near the airport is to get into bed as quickly as possible once you land, and to be able to sleep in the next morning and leave the hotel later than you’d have to if you were staying downtown. If you have to wait half an hour for an airport shuttle, or you can’t rely on the time the shuttle will leave the hotel and therefore have to present yourself downstairs early to make sure you get a seat or don’t miss it, you give up that time advantage. 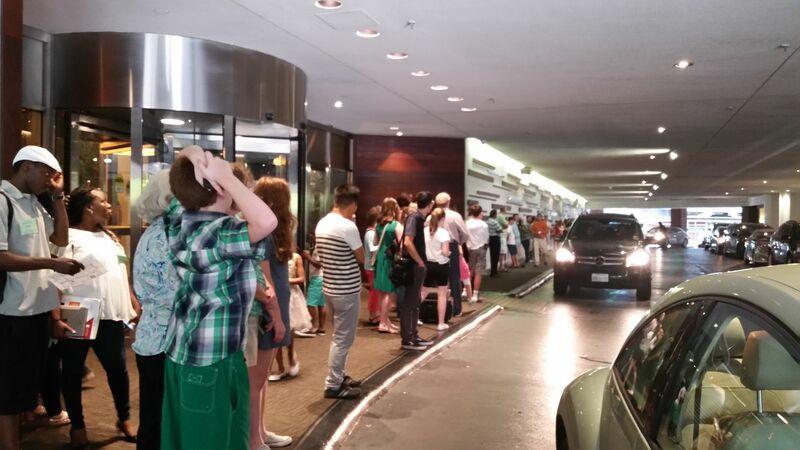 The Shuttle End Times Came at the Sheraton Gateway LAX — These Were the People Who Were Left Behind. And you’ve wound up trading a nicer place in a better location for a nondescript airport property — without the countervailing benefit of proximity (timeliness). “This room has too many outlets” said no hotel guest, ever. Older hotels often have no or very few outlets, and those that are available are badly placed. They’re in use for lamps, they’re behind the bed, or blocked by a large desk. If a room is meant to accommodate two people then assume that both people need to charge a laptop, a phone, maybe a tablet or a wireless internet device, and an external battery. There needs to be outlets available at the desk, and also by the bedside. Many people want their phones beside the bed. I only want mine there when there’s no easily visible alarm clock. So there need to be multiple outlets, in multiple places, conveniently located. I know not everyone has had perfect experiences with guaranteed 4pm late checkout for elites (outside of resort or convention hotels where it’s subject to availability) but it’s never been denied to me at a hotel where it’s a benefit. I especially value Hyatt properties where I find I’m nearly universally proactively offered late checkout when I’m checking in. Clearly it’s part of their procedure. So when a guest says, “yes I’d appreciate a 4pm checkout” they should code the keys for a 4pm late checkout. I’ll usually remind them to do this. But I don’t always. And every time I fail to offer the reminder I’ll go back to my room on my day of checkout at, say, 2pm and find that my key doesn’t work. So I have to go down to the front desk, where they’ll make me a new key, and then it’s back up to the wrong. This one doesn’t seen to be that hard to get right. Last fall not only didn’t my key work at the Hyatt Regency Dallas but my belongings had been taken, too. At midnight at the Hyatt Herald Square I wanted to go to bed, so I went about turning off the lights in my room. Only I could not figure out how the light on one side of the bed turned off. There was a simple light switch on the other side. Easy. You’d think the lamp on the other side of the bed would work the same way. But it didn’t. I walked around the room looking for light switches, and couldn’t find one that would turn it off. There were two switches beneath the light, next to power outlets. I tried each of them, and neither turned off the light. My first thought then was that the switches must control the outlets. Since they didn’t turn off the light. Flip the switch on the right, the light was still on. Flip the switch on the left, the light was still on. It took me 15 minutes to figure out that you have to flip both switches in order to turn it off. The last thing I wanted to do was deal with getting help from the hotel at midnight. Wait for help from the hotel at midnight. To turn off a light in my room. But I knew I’d need to, because as much as a part of me was wondering if I could just fall asleep like that, I knew it was a bad idea. I’d fall asleep, but then I’d be up in an hour. And sleep off and on through the night. Hotel room design must be intuitive. Turning lights on and off in your home is iterative. Since you turn the same lights on and off over and over you train yourself in a way that it’s second nature. But each light in a hotel room is used once or a handful of times by a person approaching it for the very first time — every single day or every few days. Everything in a room needs to be intuitive. What Are Your Pet Peeves? What Have I Left Off the List? Are my pet peeves peculiar to me? What are the basic things hotels get wrong that keep you away from repeat stays? What are your must haves and pet peeves you’d like to fix? Hot room with thick quilt is always the worst! 1.Audio/docking devices with a bright blue light, sometimes they flash, presumably to guide you to it in the dark. Sleep disturbing unless unplugged. 2. Those pressure sensitive mini bars…move something a fraction of an inch and it’s on the bill. 3 Beds made up so tightly that it’s impossible to get into them. 4. Duvets/doonas, @David mentioned. I like them but only if they’re large enough. Some hotels , particularly in a Germany, offer ones that are more child size than adult. 5 ignoring the DND, eg by telephoning when the DND is on to ask about checking out or other issues. Reading lights should be provided above and behind beds on both sides. Most hotels have standard lamps with semi-opaque shades which are worse than nothing. Also bright down lighting in the ceilings above the bed can be problematic if no suitable back lighting is provided as described above. Grrrr..
My biggest peeve is the quality of the room furnishings and finishes. I expect cheap particle board in Motel 6 but I expect high end hotels to have well maintained decor and high end furnishings. While staying at the hotel, which I believe is a Sheraton at the airport in Amsterdam, we stayed on the business floor. The rooms had doors so heavy (seemingly to keep out terrorists) one had to use one’s body weight leaning against it to open. However, the quality of the furnishings were less than the cheapest motel 6. The “Business Center” looked as if it had been emptied by thieves. There were many and spacious countertops which seemed to have accommodated computers and printers at one time, but not when we were there. The food service area was large but no food. The contents of the “business center” comprised a few diner like tables. :We love gorgeous hotels and last Christmas went to the Builtmore in Coral Gables, Florida-a very high end neighborhood. I believe the hotel is part of the Waldorf Astoria stable. A friend goes there every so often for R and R and recommended it highly. The hotel is stunning, hugh-it used to be something else which escapes me at the moment. Amusingly, my husband hired a car to take us there because one could not pull up to this quality hotel in a cab. Care was taken to preserve in the public areas, the many mosaic floors, ceilings, furnishings, etc. It just didn’t disappoint us but actually sadden us that the repairs made in our room – the flimsy doors, sloppy painting, towel rack holders which were not the same size as what these new ones were meant to replace. The area around the new holder attached to the wall had not even been filled in and painted over. We might as well have been in Motel 6 and paid hundreds less. There were no activities except for the pool and golf course. Obviously this is where focused upkeep is. The pool is huge – L shaped. But even at a beach and in the ocean, have two children there and they fill the entire area. Since it was Christmas, that pool was the babysitter for the children. We walked the hotel marveling at the public areas and then entered our hovel. We ended up watching movies at an astronomical price. And there was no coffee in the room which I would have forgiven if the room matched the price in which case there would have been coffee. We love to cruise and one of the reasons we do so is that we choose a high end small suite with a lounge and a concierge on duty. Everything is perfect. I am the most judgemental person I know and I can’t ever find a complaint. This is the standard against which I compare hotels that market themselves as high end and find very, very few that stand up to the hipe. 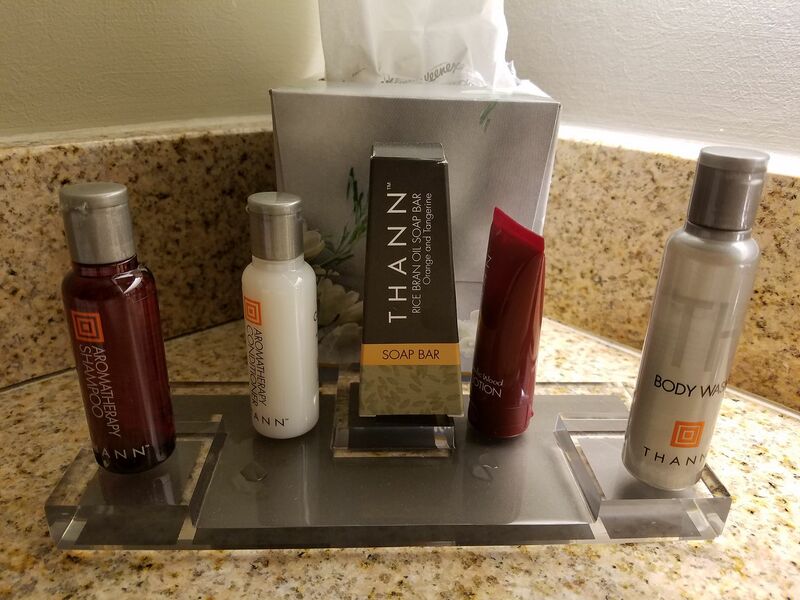 Hotels can do so many things right, but then the little things they don’t do can ruin a stay. It’s like a football player doing an amazing run, then fumbling at the 1-yard line and failing to score. What a letdown! @Janet Sneath, I don’t think the Biltmore in Coral Gables is part of the Waldorf Astoria brand. The Arizona Biltmore is, but not the Biltmore in Coral Gables. I think that one is independent and, therefore, not held to any brand standards. WTH with regularly miscoding room entry cards? I automatically ask for double keys regardless of number of rooms/# of ppl in the rooms because I can usually count on 1/2 of them not working. And if none work (grrr) then I have to walk back down to the front desk which can sometimes be a ways off esp at resorts. Or call security to bring them to me from my cell phone, but then I am uncomfortable hanging out in the hallway. This happens at all levels of properties, & I just do not get what training is being neglected that this simple task is so regularly messed up. Everything else you write, Greg, closely follows. And I would add that a property claiming to be “green” sometimes translates to “lazy” or “cheap” (RIP plastic straws). My pet peeve is when the hair dryer is stored somewhere other than the bathroom (often hanging in a closet near the iron, but now always). You usually don’t discover the problem until you’ve just gotten out of the shower and are ready to dry your hair. Very frustrating! Ditto on the power outlets. Trying to set up an ironing board is often a challenge for this reason. Windows or balcony doors that don’t seal out the noise. I was in a high floor at the Hyatt Regency in San Francisco when Occupy Wall Street people decided to protest outside at Midnight. Couldn’t believe how much I had to hear in my room. Poor lighting in bathroom! Waiting for the day when attention is paid to the fact that makeup is applied and hair is dried and styled while seemingly in a cave. Bathrooms so often are interior, without a window offering additional light to compensate for the poor artificial light provided. And, rooms with openings into the bathroom from the bedroom, you know, where you’re told it’s to let you see the view from the tub or some such thing, do not do the trick. TucsonRose just hit on something that is a major peeve of mine that is not limited to hotels. This is where you have smoke free buildings, but to get in them, you have to walk through a smoke screen of people standing right by the door smoking…so you still end up smelling like smoke. I know some cities have laws saying you can’t smoke within so many feet of a building entrance, but it seems this is seldom enforced, and if not enforced, the laws are useless. And definitely, the smoke free hotels should have a strict policy that is strictly enforced not allowing employees or guest to smoke anywhere close enough to an entrance that people going in and out can smell it. My pet peeve is when the shower drain is partially clogged and within 3 minutes of your shower you realize the water is slowly creeping up to become a bath as well as shower… It’s particularly annoying because you cannot get it fixed until AFTER it’s already affected you!